In this day in age when running backs are considered over the hill at 30, when salary caps restrict teams from signing core players/fan favorites (see Alexander, Lorenzo) it’s hard to imagine a team negotiating with a 36 year old running back with a bad back and 2 bad hips. However, that’s exactly what the Redskins did with future Hall of Fame Running Back John Riggins during training camp in 1985. The 17 day holdout would result in Riggins receiving the largest 1 year contract in the history on the NFL for a running back, $825,000…not exactly chump change 28 years ago. To recap…hold-out running back, 36 yrs old, bad back and hips…but wait there’s more!!! Riggins was just 3 weeks removed from an arrest for being drunk-in-public in Reston, VA. The drunk-in-public charge came just a few months after the famous “loosen up, Sandy baby, you’re too tight” comment to Supreme Court Justice Sandra Day O’Connor at a black tie Congress dinner. Riggins quieted up after he blurted that comment…as he passed out under the dinner table. Now we’re dealing with a broken down running back with a drinking problem!!! You have to admit that Riggins had a set of brass balls on him. While he had a nice season in 1984 (1,239 yds rushing & 14 TD’s), age and injury were clearly stacked against him. In addition, you had the drinking issues along with the fact that the Redskins had traded for George Rogers the previous off season. Rogers was just 27 years old and had accumulated 4,267 yards rushing in 4 seasons. Riggins held out while his chosen replacement was learning the offense. In the end Riggins had the only ally he needed on his side, Head Coach Joe Gibbs. Gibbs was loyal to Riggins and convinced Jack Kent Cooke to open the checkbook one more time for the Diesel. The 1985 season would be Riggins last season in the NFL. 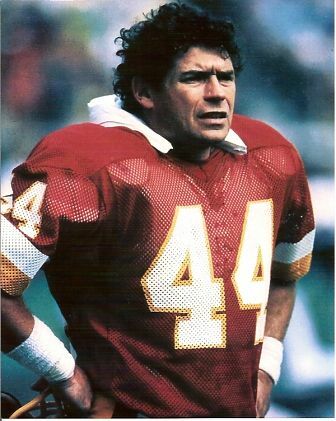 Riggo played in 12 games, starting 11 and rushed for 677 yards and 8TD’s. The full article that appeared in the August 26, 1985 issue of Sports Illustrated features many more nuggets including Riggins saying “I’ve been embarrassed and humiliated by the boners I’ve pulled”. Oh Riggo…you were one of a kind. View Comments - What do you think? Those were real men back in the day! Fatpickles T-Shirt Shop New Items Added!